The persistence of the dipole anomaly and really been impressive over the last month. The SLP difference between the easern and western Arctic is massive, driving strong winds across the Arctic toward the Atlantic sector, helping to bolster extent in this region. At this time of year, the dipole generally reduces extent losses due to ice export and refreeze. As we move into May, the mid-latitudes will gather a lot of heat, which will start to get pumped into the Bering strait region, causing strong melting there. Meanwhile, the air over the Arctic warms to the point that the dipole driven export cannot be replaced with fresh, thin ice cover and the air blowing over the Greenland/Barents region becomes milder and less likely to produce any fresh ice amongst the export. As things stand, the ECM continues to support a dominant dipole pattern. Even the 8-10 day mean height comparison charts suggest a continuation, with the ECM bringing in some very mild air over the Bering strait and Okhotsk regions (at that timeframe, model accuracy isn't great though). A comparison of the April SLP anomaly from 2007, and April so far this year. With the forecast going for that strong low over the Barents/Kara/Central Arctic region, we could end up with a very similar Arctic pattern to 2007. And I thought the 'Perfect melt storm' synoptic was at least 3 years away BFTV! (LOL) It would not be a good year if we did see a return of the 07' synoptic whilst a Nino formed in the Pacific. Just how much heat would be being pumped into the atmosphere in sept/oct if we had another record melt and Nino conditions??? This appears to be truly unprecedented for mid-April in all the previous years' CT maps. Is it just me or is there something truly frightening about this situation??? The 12z Euro and GFS are brutal ashell. THIS WILL NOT ONLY SCREW THE ARCTIC IT WILL SCREW GIS. Do you have a link to images or animated forecast? Holy cow, that is insane!!! At first I thought you were exaggerating, but I looked at the models and my jaw nearly dropped to the point of falling off my face. Been watching that Greenland high and dipole in the models over the past few days. A rather exceptional pattern to say the least. Any good prognostications for direct impacts? GFS surface shows near freezing temps circling the Arctic Ocean. We get a big temperature spike up to around 30-40+ F in some sections of Greenland. Pattern seems to fade out pretty fast. I can't see it. I suspect this is a sarcastic reaction to the overuse of Majuscule. Well, at the moment, besides being aware there is a cyclone churning away in the ESS/CAB, I have no context. If this is a serious posting, I'd love an explanation. Normally Nightvid and Friv are pretty much on the level. Have you seen those maps on Cryosphere Today? Please, tell me how to put links, I don't know how to do it! 1. Massive MYI fram transport. Nearly 100 percent MYI now. This is forecast to be just awful into May. 2. Southerly winds in the Beaufort pushing the ice off the shore/fast ice and causing a region of open water to form. While also having mostly sunny conditions and solar insolation of 320-375W/M2 from now into early May. This is quite strong. That heat will go into the water which will be blown towards the ice that is being pushed away from the shore. This helps melt the ice dramatically faster than without open water. 3. It promotes a massive region of warm sunny skies with will kick the snow/ice albedo feedback into gear. 4. The Russian ice is being pushed away from the shore. so new ice has to replace the older FYI that is much thicker. But it's to warm now for that ice to thicken up very fast this is a huge blow towards easy insitu melting and open water very fast into May. 5. There is a massive influx of warmth into the cryosphere while that warm air is stripped of it's heat the left over cold is the Kara region/Baffin/Atlantic side where it doesn't nothing to help the ice this summer. The Pacific side ends up very warm. Thanks, Friv. I figured you to have some substance to your "yell", and I can see where your distress came from. Fram export at full bore will be about 8-10K KM of ice a day, under ideal export conditions, which it seems we have. I'm far more worried about the albedo changes, availability of insolation and what the dipole is doing to the existing ice. This pattern develops when the current severe Low fades, around next Thursday. The pic above is prognosed for Wednesday 30th. A long way out. Even so, it looks as though the direction is clear. As Wayne has suggested, there’s a strong potential over the Canadian Archipelago to support high pressure. Analyzing the prognosis above, it looks as though the Bering Sea ice will quickly disappear. The already breaking ice in the Chukchi may deteriorate rapidly. The wind pattern doesn’t feed right into Fram, but will continue pushing ice into the Barentsz Sea, where it melts. Fram export continues, probably mainly through sea currents. Together, these processes promote quite severe volume loss. Then, there’s the albedo side. I don’t know if there will be more than usual sunshine. The Lows on the Sib side are probably cloudy. If Friv is right, it looks like most sunshine will be over the Beaufort Sea. When the stress lead along the fast ice opens up swiftly, it could make a large difference with the melt process last year. The EURO IS EVEN CRAZIER HOLY CRAP. Remember folks, that while the ECM is the best in the 5-7 day range, anything beyond 5 days needs to be taken with a pinch of salt, and any individual model runs beyond 7 days shouldn't be taken seriously at all, as those scenarios will chop and change several times per day. Beyond 7 days, looking at the upper level pattern and the trends and comparisons between different models can give an idea of how things may turn out. Laptev seeing massive ice movement. This is not good at all. That new ice isn't going to be able to get very thick. Like by the time we are 10-14 days into this dipole. There will be a dramatically large area of brand new ice that formed during this period. All of that ice will be very thin 10-30 meters or so if that because temps are pretty warm and solr insolation is at 325w/m2. If this pattern is dominant thru the end of June. 2014 would already be well below every other year. Another 2007 and all metrics would demolish records. The North Atantic is also going to get very warm. few posts above, it was mentioned that significant (to say the least) amounts of sunlight will be absorbed by dark open waters where usually there is ice (by this time of the year). This, though, is not all. In everyday terms, one part ice at 0 °C will cool almost exactly 4 parts water at 20 °C to 0 °C. (some numbers about it - see http://en.wikipedia.org/wiki/Heat_of_fusion#Applications ). The opposite is also correct: heating 4 parts of water from 0 to 20 °C - would be prevented, if there was 1 part of ice in that water at the start. Which, regarding mentioned above regions, is not the case anymore: those regions on photos above - open water have no surface ice, and it seems quite like a glass with dark bottom and without ice cubes, and then that glass is put into the sun. I mean, this is about much faster local temperature rise, since there are no "ice cubes" (in those locations) to halt the temperature rise (driven by sunlight). This will definitely alter athmospheric events in Arctic significantly (short-term), among other things. I'd expect an increase of number but reduction in average size of athmospheric events in Arctic, as such conditions (more "glasses without ice cubes") develop significantly during last decade. I wonder if such a trend could already be noticed during last ~10 years. Myself, i don't have reliable relevant data to answer this. near-surface warm water currents are obviously another thing. Good oprtion of that heat which "was expected to melt ice _here_, but since there was no ice _here_ this year - this heat was spent to warm up water _here_ instead" - good oprtion of this heat will be transferred by water currents to nearby location and it'll "meet" some ice some time later, and will melt part of it. Thing is, _that_ ice _there_ - has its own melting forces ("traditional" ones), so it'll melt faster - whole thing feeds on itself, the less ice is there, the more warm water "attacks" it from more and more directions, more and more often. Important thing is, this will get extra heat into cloudy places and effect things there - unlike albedo positive feedback, which is very dependant on (absense of) the cloud cover. I will speculate, at the risk of being corrected. hPa current conditions and forecasts show us the current pressure gradients across geography. From that we can derive the forces currently shifting masses of air (and storms) and come to some reasonable (but decreasingly reliable) conclusions as to what that movement and energy will do at the surface. It is much more likely to provide insight into weather conditions in the near future than temperature maps. Perfect Wind fields and the most ideal melt conditions coalease extremely well. If you have one then you have the other as well. However the arctic can be really warm because of a massive HP over the Laptev, Kara, Barents but with a SLP region over GIS/CAA it will have goods winds for the ice while bad temps for the Atlantic side. Models are showing a major arctic dipole anomaly strengthening(We have been in a SLP based arctic dipole anomaly for a while. SLP based means the SLP was the wind driving force with closer to normal HP. Now the SLP is weaker but still a broad deep region of low pressures. While a huge HP forms over the GIS/CANADA SIDE. This not only warms the arctic up dramatically it completely displaces any PV anomaly over the pole where it can get strong and cold. Warm winds from the PACIFIC and NA are brutal as the North ATLANTIC that is already warm/Russia is the cold exhaust. Well in our warming world the air goes in warmer than it comes out equivalently cold. In the end we are in a PATTERN. That is sarcastic for terrible. It is much more likely to provide insight into weather conditions in the near future than temperature maps. It is so, but I hope that meteorologists in their temperature forecast already include that and very many other factors and that seeking of "torches" on 850, 500, 10, 0.0001 hpa maps when there is no of them on temperature map is like skeptic's rapid recovery after each snowfall. The ice is shaping up in a way that reminds of 'mesh-patterns' I've usually described early June in '11-'13. The first visible lead forming near the Pole is at about 3 km distance. The big ones, up to 900 m wide, begin at about 30 km in the dir of Ellesmere. The Pole is actually on a initial slab of about 340 km2. When the weather patterns persist, the situation could be comparable to the shattering we saw last year as early as June. In the laptev direction, the grinding into small floes is even more advanced. The mean surface of the big ones lies around 75 km2, surrounded by 5-10 km broad, rubble filled leads. I know it is of small value to prognose right now. However, if last season showed the extended range of what's possible now through weather, this season might produce the counterpart! A 100x100 km swath centered on the pole. I made a polyline on the establishing 'Pole-floe'. To enhance the features, clearness/contrast/midtones were set at -10/+15/-60. Thanks very much for that Werther. I've made a copy available at the link below. I hope that's OK with you? Context question(s): what sort of timeframe anomalies are we seeing with these fracturing events? Do they suggest a change in system state that makes comparisons to previous events irrelevant? Is this now a completely different pattern of behavior? I've filed lots of 'relevant' MODIS tiles, but usually later in the season. So, further than 'this was quite a Low' I'm probably not reliable when I claim anything special for this year based on the MODIS pics of late. I have a copy of the N Greenland tile 11042012. It looks rotten near the Pole like it does now. That's as good as I can compare... '12 was a disaster year, so??? Too bad they're not doing the Barrow Break-up stuff anymore, although in this case it seems there's still a sliver of fast ice clinging to the coast. My questions are more to provoke contemplation than interrogation; our historic data on this is anecdotal and limited, for certain. Are we now seeing (rather than predicting) a substantive system change in the cyclical behavior of Arctic climate? Is it sufficiently different from previous behavior that comparisons with previous states may no longer correlate correctly, and new events may be arising as a result of mostly different causative mechanisms? For example, it has been argued (but not here) that 2013 represented a natural return to "typical" arctic behavior, driven by the same generalized forces in climate that have underlain it's behavior since close study began. That would infer recent low years we outliers rather than trend. (You should be able to see where I'm going with this...). However, if we have a distinct change in system limits and forces being applied, then that would infer 2013 is the outlier (which is what I think, but think we should test, somehow...). What might we measure to make such a determination? Unfortunately, most of what we see are effects, rather than causual. Well, realize that 2013 had the least melting-favoring atmospheric circulation in the satellite record, possibly with the exception of 1996. Very low SLP patterns in the crucial early melting season and DMI polar temp. was below average from Mid-May to late August continuously, a first. The cloudiness and cyclones in May and June were truly extraordinarily persistent. 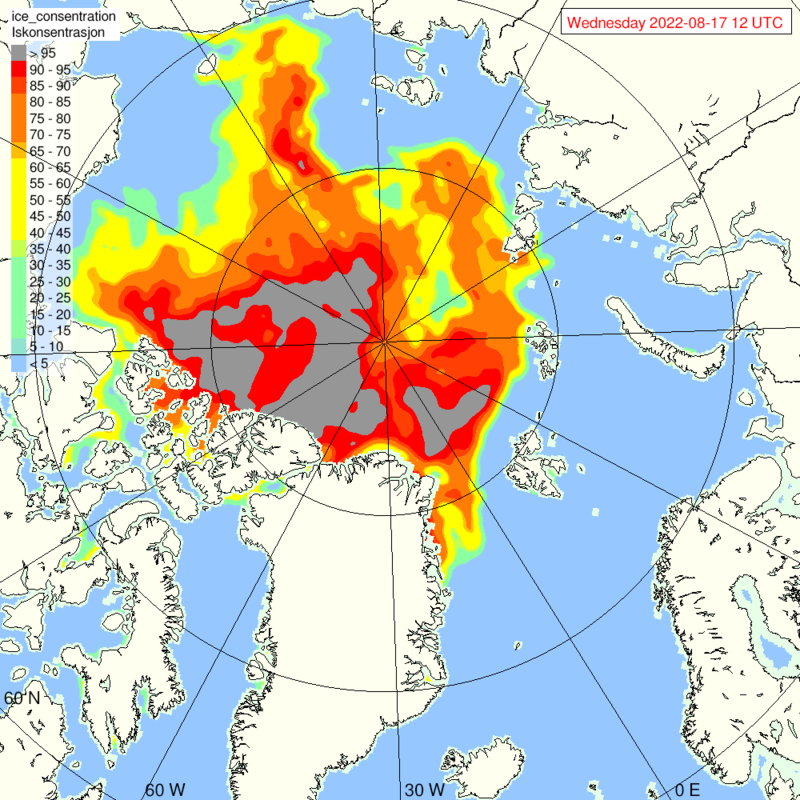 As a result, surface melt was delayed until the second week of July in most of the Arctic Ocean apart from the peripheral seas. Yet the minimum extent was still FAR below anything pre-2005. Look at the pre-2005 minima, and imagine 2005 being at 2013's level. It would be an amazing crash in extent in a single year if it happened then. Yet now, it seems to be the most ice Mother Nature can retain given a very cold and overcast summer. One week early in the melting season saw some large decreases followed by a rebound. The net result is according to Jaxa (AMSR-E L3 data used) about -320k in sea ice extent and -410k in area. The day to day differences with 2013 are similar ( -260k and -410k) so 2014 is almost one week ahead. Decreases took mainly place in the following peripheral regions: Bering and Okhotsk on the Pacific side and StLawrence and Barents to the Atlantic. And a difference map is attached. Your graph shows 15-22 April, roughly the lifespan of that strong low in the Arctic. Its effect on SIE/SIA show mainly in the Barentsz Sea. The wrenching it did has no direct influence yet in the CAB. I was surprised this morning watching MODIS; Bennett Island N of the New Sib Islands is creating interesting orogenetic clouds to it's NW. It co-incides with a not very usual Jetstream branch entering the Arctic from the Kolyma region. The Jet branch accompanies a ridge that fuels a small heat-wave over the Amur river basin and brings spring and snow melt to the boards of the Arctic Ocean. It fits with a strong dipole. It lasts into next week and fills the lower troposphere over the Arctic with relatively warm air. Leaving just a layer of cold above the ice. I guess that's exactly why Bennett Island creates such beautiful clouds in this flow. The wide stress lead along the Siberian fast ice moistens the flow from below. When it's pushed up over Bennett, the moisture condenses, forming 3 km high rippling clouds. What does this mean for the ice? I don't expect massive losses through this dipole for the next few days. But watch out when the pattern eclipses after next monday. Next week may bring large losses in the Barentsz/Kara sector. A new interactive 3D globe for displaying jet stream, 850hPa temperatures, 500hPa heights and SLP forecast animations is now on the meteociel website. Hopefully they'll add more options to it in the near future. "Water sky blink" is visible on the Barrow sea ice webcam now!! This is what happens when Cryosphere Today meets Photoshop in order to show the difference in snow cover between April 21st 2013 and 2014. Bright red indicates partial reduction of snow cover, while darker red indicates a reduction from full snow cover to no snow cover, the blue colors are the opposite. And up until about June 1st, I am much more interested in watching the snow retreat than the sea ice retreat because the snow retreat is much more rapid during this part of the melting season and has much larger albedo feedback effects than the sea ice. If I was looking for record low sea ice extent come September, I would trade 1 million sq. km of sea ice extent for 5 million km sq. km of snowcover on May 15th any day of the week. There is negligible difference between 2014 and 2012 for certain. Snow cover and air temperature are far less important in my opinion, than open water and open skies. At this point, increasing portions of the arctic are under 24/7 insolation. Melt ponds and leads become the driving forces, far more than continental conditions. Now counter to that... disappearing snow cover *DOES* turn into melt river volume, which has been shown to have a significant impact on near-shore ice both in the CAA and across Siberia.